The future is urban. Indeed, the battle for sustainable development will be won or lost in cities. Not a moment too soon, then, that urbanization is suddenly at the centre of global policy making. In 2015 the governments of the UN adopted the 2030 Agenda for Sustainable Development and in 2016 they adopted the New Urban Agenda. However, the question of how these Agendas will be pursued concretely remains. Unfortunately, the prevailing model is rigidly technocratic Charter of Athens from 1933-the strict functionalist separation of activities that it prescribes still dominates planning practices worldwide. 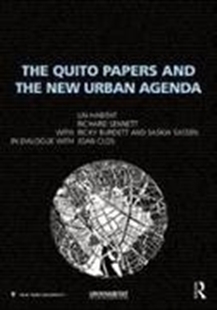 The purpose of The Quito Papers and the New Urban Agenda is to start a discussion that both challenges this status quo and opens up new lines of enquiry. It intentionally does not propose a manifesto made up of simplistic slogans and recommendations as cities in the 21st century are more fragile and complex. Its content, therefore, is intentionally broad, ranging from architecture, planning and urban design, to land ownership and regulation, water management and environmental philosophy. This multifaceted assembly of perspectives critiques the tenets of the Charter of Athens, identify new trends and propose new insights on contemporary urbanization. Part One outlines the overall challenges facing cities in the 21st century and Part Two offers a number of conceptual frameworks and approaches for dealing with those challenges. Each Part is also composed of a body of illustrated arguments, synthesized from selectively-abridged background papers from over 15 commissioned authors, interspersed with in-depth papers.